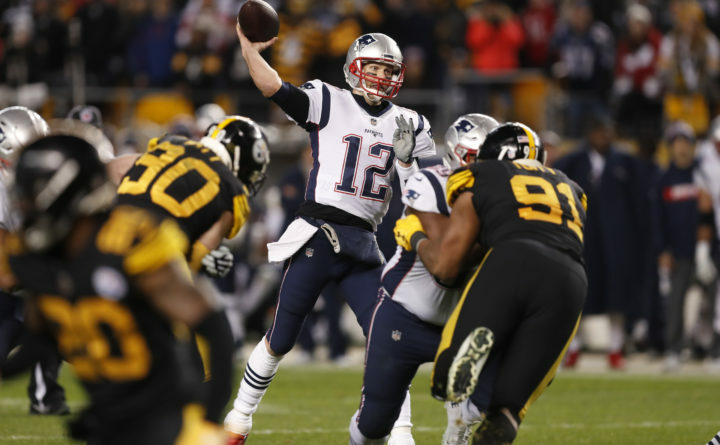 New England Patriots quarterback Tom Brady (12) throws a pass during the second half of an NFL football game against the Pittsburgh Steelers in Pittsburgh on Sunday. The Steelers won 17-10. A week ago, the Los Angeles Rams lost on the road and in the cold to the Chicago Bears. Nobody overreacted. Jared Goff has a brief history of struggling in weather below 32 degrees, and the rest of the team’s schedule and likely playoff path had them playing in Los Angeles or in domes. But Sunday’s 30-23 home loss to the Philadelphia Eagles raises some questions. All of a sudden, the unstoppable Rams are out of sync. Sure, at 11-3, the Rams are still in line to be the No. 2 seed in the NFC with a bye week and a home game in the divisional round. But while it isn’t time to panic, Rams Coach Sean McVay has to figure out what’s wrong, particularly on offense. The Rams’ curious regression is just one of several big questions that remain unanswered with just two weeks to go. That’s where we’ll start this week’s column, before looking at the extremely tight AFC West race, a Bears team that keeps looking more and more like a Super Bowl contender, and some concerning signs for the Patriots. Is the Rams’ offense in trouble? Trouble? No, but there has to be some concern. It’s not that teams have figured out McVay’s offense, but defensive coordinators have finally come up with at least some answers. The loss of wide receiver Cooper Kupp is starting to show. Against the Eagles, 25 of Goff’s 51 targets were to either Todd Gurley and Josh Reynolds, and it was clear Philadelphia was willing to give up underneath throws so long as they limited the big-play abilities of Robert Woods and Brandin Cooks, whose longest receptions were 20 yards. Cupp’s presence took that receiving corps to another level, both underneath and down the field. The Rams are also overly reliant on Gurley, which became clear when he suffered a knee injury in the third quarter that sidelined him briefly. McVay admitted that the runner’s absence limited the offense on early downs. That put more in the hands of Goff, who struggled, with two interceptions, no TDs and a subpar QB rating of 66.8. Over the past three games, Goff has thrown just one touchdown to seven interceptions. Many of these issues are fixable, including some recent struggles of the offensive line in pass protection. But the nearly unstoppable force of earlier this season has looked very different these last three weeks. Believe it or not, it could be the Chargers. Week 16 could decide it. The Chargers host the Ravens in a game that matters greatly for both teams’ playoff hopes. The Chiefs have a tougher matchup, on the road against Seattle on Sunday night. Running back Melvin Gordon is expected to return for the Chargers, and that’s huge. But the Ravens have proven during Lamar Jackson’s 4-1 stretch as a starter that they can compete against good offenses so long as they keep scoring down and don’t fall too far behind. While Patrick Mahomes will give the Seahawks’ young secondary problems, the Chiefs’ offense clearly misses Kareem Hunt. Spencer Ware is a good, physical back, but he’s not going to break off big plays the way Hunt did, which is what took this offense to another level. One could argue that Hunt’s departure, combined with the foot injury to wide receiver Sammy Watkins, took a touchdown per game away from Kansas City. The Chiefs’ defense can be run against, which is trouble against Seattle’s fierce rushing attack, but when they get a lead, their pass rush can be very effective with Justin Houston and Dee Ford on the outside and Chris Jones on the interior. Both teams close out the season with winnable AFC West games in Week 17, but the Chiefs need to beat the Seahawks – or see the Ravens upset the Chargers – to win the division. If not, they would drop to the No. 5 seed, meaning they’d be on the road for the entirety of the playoffs instead of earning a first-round bye and home-field advantage. For the first time since 2009, New England might have to play in the wild-card round. Following Sunday’s 17-10 loss in Pittsburgh, the Patriots find themselves in the No. 3 seed, meaning they would need to win a home game and then two road matchups to get back to the Super Bowl. That’s a problem, because this team is 3-5 and has struggled to score points on the road this season. The franchise hasn’t won a road playoff game since 2007. What was also glaringly obvious in Sunday’s defeat is that the Patriots lack playmakers on defense. They also haven’t been able to stop the run the past few games. Which team will claim the AFC’s No. 6 seed? All of a sudden, the odds are shifting to the Indianapolis Colts. Sunday’s 23-0 victory over the Dallas Cowboys was a major step forward for the Colts, who have rebounded from a 1-5 start. They are in a three-way tie with the Ravens and Titans at 8-6. But the Colts’ closing schedule includes a winnable game versus the Giants and a tough Week 17 showdown in Nashville against the Titans. Baltimore, meanwhile, has the aforementioned road game against the Chargers next week. The Ravens can’t afford a slow start in that one, as Jackson has been very effective as a runner but hasn’t yet been asked to rally his team from a big deficit by throwing. Can the Bears win the NFC? That’s probably too much to ask, although the Bears continue to impress. Mitchell Trubisky brought out of a three-game slump by completing 20 of 28 passes for 235 yards in a 24-17 victory over Aaron Rodgers and the Green Bay Packers, and the Bears won their first division title since 2010. They have proven tough to beat at home, winning seven of eight games. But it’s worth remembering that Chicago’s path to a Super Bowl berth would likely require consecutive road games to beat Goff and Drew Brees. Sure, Trubisky and Chicago beat Goff and the Rams at home last week, but playing in L.A. would be a different story — and Trubisky still threw three interceptions in that game. Trubisky did learn a good lesson during his three-game slump. He didn’t try to force plays in the win over Green Bay. “Don’t do anything crazy,” he said. The Bears were able to methodically move down the field. Are the Eagles a threat with Nick Foles? Philadelphia was very impressive in its win over the Rams, and Foles reminded that he’s capable of winning the big games, completing 24 of 31 throws for 270 yards in the victory. He found Alshon Jeffery for several big plays, totaling eight completions for 160 yards to the big wide receiver. He makes the Eagles a viable threat if they were to make the postseason — now that we know Carson Wentz has been bothered by a back injury since October, Foles gives the team more options as a deep thrower — but they’ll need help. Not only does Philly need to beat the Texans next week and the Redskins in Week 17, but it needs the Seahawks or the Vikings to stumble in front of them. Vikings Coach Mike Zimmer finally got his way. He couldn’t get offensive coordinator John DeFilippo to run the football, so he fired him. New coordinator Kevin Stefanski dialed up 40 rushes for 220 yards in a 41-17 blowout of the Miami Dolphins. Zimmer thought DeFilippo had too much in his playbook, so Stefanski tried to simply things. He had Cousins take more snaps under center instead of in shotgun. With 40 runs, Cousins only had to throw 21 passes in what turned out to be an easy victory. — 49ers Coach Kyle Shanahan decided to start looking at younger players following a 43-16 loss to Seattle two weeks ago. In doing so, the 49ers have come up with wins over the Broncos and Seahawks. In the 26-23 overtime victory over Seattle Sunday, the 49ers had as many as five rookies playing significant snaps on defense, including three in the secondary. They are fazing out veterans such as Earl Mitchell and Malcolm Smith. The result is a faster defense than what it had earlier in the season. — It’s remarkable how bad the Packers have been on the road. After losing to the Bears 24-17, the Packers are 0-7 in road games, even with Rodgers at quarterback. — If the Arizona Cardinals fire Steve Wilks as head coach after one season, it’s not out of the question they would look at former Cardinals defensive coordinator Todd Bowles, who might be fired by the New York Jets. — Denver Broncos Coach Vance Joseph didn’t help his job security with Saturday’s 17-16 loss to the Cleveland Browns. He is getting criticized for going for a field goal in the final five minutes when he was down by four. He said he had confidence in his defense, but the secondary has been crushed by injuries.